Of, relating to, or required by a canon of law. Conforming to orthodox or well-established rules or patterns, as of procedure. As I mentioned at the conclusion of a previous post, I believe strongly in the power of imagery to symbolically represent complex ideas. Symbolism can become a powerful means of communication, both by its parabolic method of conveying layered meaning depending on context, and its ability to inspire the passion or madness that fuels entire movements. As a result, I am always drawn to reducing the complexity in my everyday professional life to simple images or symbols that capture the essence and literally replace the thousand words with a single image that “says it all“. Another term for this reductionism, or attempts to capture the inherent essence of something, is “Canonical“. The word Canon most often describes a body of works in a given field (e.g., works of literature, or of art, or of music) deemed worthwhile for student to study and for scholars to investigate. The word “canon” is derived from the Greek (akin to the English ‘cane’) referring to a reed. Reeds were used anciently for measurement, and later became associated with a rule or standard by which things were measured, or judged. We see this in the establishment of religious canons, or the instances where a representative, definitive, and accepted body of work becomes the measure by which all other related works are judged. Distributed under the Creative Commons Attribution, Non-Commercial, Share Alike 2.5 License.Updated on 5/30/07. Realize that Health 2.0 is all about Patient Empowered (not the misnomer “Consumer Directed”) Healthcare whereby patients have the information they need to be able to make rational healthcare decisions (transparency of information) based on value (outcomes over price). In the Health 2.0 paradigm, everyone in the healthcare process is focused on increasing value for the patient. 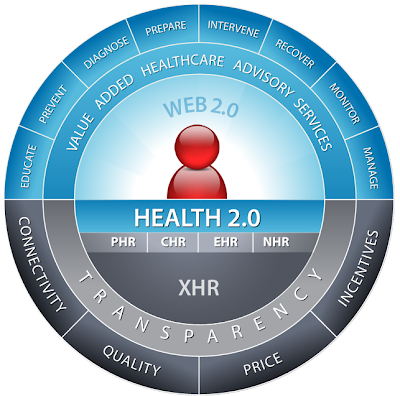 Realize that Health 2.0 is absolutely reliant on interoperability of health information. Everything from the Personal Health Record (PHR), to the Clinic Health Record (CHR), to the Enterprise Health Record (EHR), to the National Health Record (NHR) must be based on standards, be seamlessly transitioned between environments per standardized security and privacy protocols, and be accessible anytime from anywhere. Undergirding this foundation of information, the Four Cornerstones (Connectivity, Price, Quality, and Incentives) of the Value Driven Healthcare movement begin to create a virtuous cycle of innovation and reform. Transparency serves as a key catalyst in this process by creating positive sum competition that can deliver better outcomes at a lower cost. As more information becomes available as a result of increased transparency, there will be a wave of innovation at all points along the full cycle of care (see slide 8-12), which includes phases where health care service providers Educate, Prevent, Diagnose, Prepare, Intervene, Recover, Monitor, and Manage the various disease states. Measuring someone’s HgA1c or Ejection Fraction does not tell you how effective their diabetic or cardiovascular treatments have been. You need to factor in the care provided over the full cycle of care to appropriately determine value. eds of companies, in thousands of forms, to millions of people who are can benefit from the remixing of medically related information. It is easy to see how the new Web 2.0 framework, with its inherent social networking and collaboration tools, will make this “long tail” of medicine a “value”able venture. These concepts are worthy of further discussion and debate, particularly since we are blazing new territory without any established rules, patterns, or procedures. Shooting my canonical representation of Heath 2.0 out into the ether is the proverbial “shot out of the canon” to stimulate the conversation. I appreciate differing perspectives, but without further description about what you “don’t agree with” I have no opportunity to convince you.